Healing the Schism of 1054! Pope Benedict XVI since the inception of his papacy has make reunion with the Orthodox sects of the Church one of the primary goals of his pontificate. The mission to restore unity between East and West is reflected in our own Latin liturgy, in the Eucharistic Prayer, when the priest prays,â€â€¦from East to West a perfect offering may be made to the glory of Your Name.â€ The prayer reminds us that the Churchâ€™s mission and ministry are indeed global in scope, including all directions of the cosmological winds. The Eastern Orthodox Catholic Churches are a cultural and ritual example of how the Catholic liturgy of the East developed differently from the rituals of the West (Latin Church). Nonetheless, both branches on the genealogical tree of theology are established in authentic Apostolic Succession. The Eastern Orthodox Church in addition to valid sacraments is part of the great artistic and ritual heritage the West shares with Constantinople. Greater understanding of the theological points that unite us rather than divide us is crucial to our reconciliation with the East. We share valid Sacraments, rooted with the primitive Church and indeed Jesus and the Apostles at the Last Supper. Disunity between our Churches was more of a political and social series of antagonisms rather than inconsistencies of theology of belief. A component of the disagreement is the Role of the Primacy of the Bishop of Rome. The Eastern Orthodox Church developed a different appreciation of the Pope and his Office. They maintained the Bishop of Rome should be accorded a â€œPrimacy of Honor, â€œas the Successor to Saint Peter, however the Patriarch of Constantinople was the temporal and moral head of the Orthodox Church. We have seen since Pope Paul VIâ€™s common visit with the Patriarch of Constantinople in the 1960â€™s to the Upper Room, site of the Last Supper real movement towards restored dialogue between both East and West. During the Pauline visit to Jerusalem, the reciprocal excommunications between Pope and Patriarch were lifted. Both men prayed the Lordâ€™s Prayer in Greek and Latin. Pope and Patriarch offered each other the Kiss of Peace and enjoyed warm embraces. Subsequent Popes since that crucial reunion in Jerusalem have all met and embraced with the Patriarch of Constantinople. 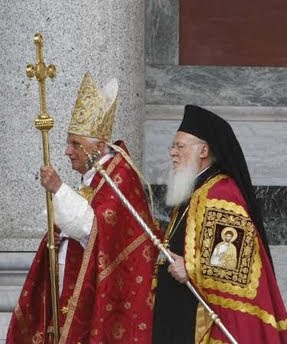 Benedict XVI even joined the Patriarch in a common profession of faith at Saint Peterâ€™s Basilica, where they both recited the creed in Greek. Î Î¹ÏƒÏ„ÎµÏÎ¿Î¼ÎµÎ½ Îµá¼°Ï‚ á¼•Î½Î± Î˜Îµá½¸Î½ Î Î±Ï„Î­ÏÎ± Ï€Î±Î½Ï„Î¿ÎºÏÎ¬Ï„Î¿ÏÎ±, Ï€Î¿Î¹Î·Ï„á½´Î½ Î¿á½ÏÎ±Î½Î¿á¿¦ ÎºÎ±á½¶ Î³á¿†Ï‚, á½ÏÎ±Ï„á¿¶Î½ Ï„Îµ Ï€Î¬Î½Ï„Ï‰Î½ ÎºÎ±Î¹ á¼€Î¿ÏÎ¬Ï„Ï‰Î½. ÎšÎ±Î¹ Îµá¼°Ï‚ á¼•Î½Î± ÎºÏÏÎ¹Î¿Î½ á¼¸Î·ÏƒÎ¿á¿¦Î½ Î§ÏÎ¹ÏƒÏ„ÏŒÎ½, Ï„á½¸Î½ Ï…á¼±á½¸Î½ Ï„Î¿á¿¦ Î¸ÎµÎ¿á¿¦ Ï„á½¸Î½ Î¼Î¿Î½Î¿Î³ÎµÎ½á¿†, Ï„á½¸Î½ á¼Îº Ï„Î¿á¿¦ Ï€Î±Ï„Ïá½¸Ï‚ Î³ÎµÎ½Î½Î·Î¸Î­Î½Ï„Î± Ï€Ïá½¸ Ï€Î¬Î½Ï„Ï‰Î½ Ï„á¿¶Î½ Î±á¼°ÏŽÎ½Ï‰Î½, Ï†á¿¶Ï‚ á¼Îº Ï†Ï‰Ï„ÏŒÏ‚, Î¸Îµá½¸Î½ á¼€Î»Î·Î¸Î¹Î½á½¸Î½ á¼Îº Î¸ÎµÎ¿á¿¦ á¼€Î»Î·Î¸Î¹Î½Î¿á¿¦, Î³ÎµÎ½Î½Î·Î¸Î­Î½Ï„Î± Î¿á½ Ï€Î¿Î¹Î·Î¸Î­Î½Ï„Î±, á½Î¼Î¿Î¿ÏÏƒÎ¹Î¿Î½ Ï„á¿· Ï€Î±Ï„ÏÎ¯â€¢Î´Î¹â€™ Î¿á½— Ï„á½° Ï€Î¬Î½Ï„Î± á¼Î³Î­Î½ÎµÏ„Î¿â€¢ Ï„á½¸Î½ Î´Î¹â€™ á¼¡Î¼á¾¶Ï‚ Ï„Î¿á½ºÏ‚ á¼€Î½Î¸ÏÏŽÏ€Î¿Ï…Ï‚ ÎºÎ±á½¶ Î´Î¹á½° Ï„á½´Î½ á¼¡Î¼ÎµÏ„Î­ÏÎ±Î½ ÏƒÏ‰Ï„Î·ÏÎ¯Î±Î½ ÎºÎ±Ï„ÎµÎ»Î¸ÏŒÎ½Ï„Î± á¼Îº Ï„á¿¶Î½ Î¿á½ÏÎ±Î½á¿¶Î½ ÎºÎ±á½¶ ÏƒÎ±ÏÎºÏ‰Î¸Î­Î½Ï„Î± á¼Îº Ï€Î½ÎµÏÎ¼Î±Ï„Î¿Ï‚ á¼Î³Î¯Î¿Ï… ÎºÎ±á½¶ ÎœÎ±ÏÎ¯Î±Ï‚ Ï„á¿†Ï‚ Ï€Î±ÏÎ¸Î­Î½Î¿Ï… ÎºÎ±á½¶ á¼Î½Î±Î½Î¸ÏÏ‰Ï€Î®ÏƒÎ±Î½Ï„Î±, ÏƒÏ„Î±Ï…ÏÏ‰Î¸Î­Î½Ï„Î± Ï„Îµ á½‘Ï€á½²Ï á¼¡Î¼á¿¶Î½ á¼Ï€á½¶ Î Î¿Î½Ï„Î¯Î¿Ï… Î Î¹Î»Î¬Ï„Î¿Ï…, ÎºÎ±á½¶ Ï€Î±Î¸ÏŒÎ½Ï„Î± ÎºÎ±á½¶ Ï„Î±Ï†Î­Î½Ï„Î±, ÎºÎ±á½¶ á¼€Î½Î±ÏƒÏ„Î¬Î½Ï„Î± Ï„á¿‡ Ï„ÏÎ¯Ï„á¿ƒ á¼¡Î¼Î­ÏÎ± ÎºÎ±Ï„á½° Ï„á½°Ï‚ Î³ÏÎ±Ï†Î¬Ï‚, ÎºÎ±á½¶ á¼€Î½ÎµÎ»Î¸ÏŒÎ½Ï„Î± Îµá¼°Ï‚ Ï„Î¿á½ºÏ‚ Î¿á½ÏÎ±Î½Î¿á½ºÏ‚, ÎºÎ±á½¶ ÎºÎ±Î¸ÎµÎ¶ÏŒÎ¼ÎµÎ½Î¿Î½ á¼Îº Î´ÎµÎ¾Î¹á¿¶Î½ Ï„Î¿á¿¦ Ï€Î±Ï„ÏÏŒÏ‚ ÎºÎ±á½¶ Ï€Î¬Î»Î¹Î½ á¼ÏÏ‡ÏŒÎ¼ÎµÎ½Î¿Î½ Î¼ÎµÏ„á½° Î´ÏŒÎ¾Î·Ï‚ ÎºÏá¿–Î½Î±Î¹ Î¶á¿¶Î½Ï„Î±Ï‚ ÎºÎ±á½¶ Î½ÎµÎºÏÎ¿ÏÏ‚â€¢ Î¿á½— Ï„á¿†Ï‚ Î²Î±ÏƒÎ¹Î»ÎµÎ¯Î±Ï‚ Î¿á½Îº á¼”ÏƒÏ„Î±Î¹ Ï„Î­Î»Î¿Ï‚. ÎšÎ±á½¶ Îµá¼°Ï‚ Ï„á½¸ Î Î½Îµá¿¦Î¼Î± Ï„á½¸ á¼Î³Î¹Î¿Î½, Ï„á½¸ ÎºÏÏÎ¹Î¿Î½, (ÎºÎ±á½¶) Ï„á½¸ Î¶Ï‰Î¿Ï€Î¿Î¹ÏŒÎ½, Ï„á½¸ á¼Îº Ï„Î¿á¿¦ Ï€Î±Ï„Ïá½¸Ï‚ á¼ÎºÏ€Î¿ÏÎµÏ…ÏŒÎ¼ÎµÎ½Î¿Î½, Ï„á½¸ Ïƒá½ºÎ½ Ï€Î±Ï„Ïá½¶ ÎºÎ±á½¶ Ï…á¼±á¿· ÏƒÏ…Î¼Ï€ÏÎ¿ÏƒÎºÏ…Î½Î¿ÏÎ¼ÎµÎ½Î¿Î½ ÎºÎ±á½¶ ÏƒÏ…Î½Î´Î¿Î¾Î±Î¶ÏŒÎ¼ÎµÎ½Î¿Î½, Ï„á½¸ Î»Î±Î»á¿†ÏƒÎ±Î½ Î´Î¹á½° Ï„á¿¶Î½ Ï€ÏÎ¿Ï†Î·Ï„á¿¶Î½. Îµá¼°Ï‚ Î¼Î¯Î±Î½, á¼Î³Î¯Î±Î½, ÎºÎ±Î¸Î¿Î»Î¹Îºá½´Î½ ÎºÎ±á½¶ á¼€Ï€Î¿ÏƒÏ„Î¿Î»Î¹Îºá½´Î½ á¼ÎºÎºÎ»Î·ÏƒÎ¯Î±Î½â€¢ á½Î¼Î¿Î»Î¿Î³Î¿á¿¦Î¼ÎµÎ½ á¼“Î½ Î²Î¬Ï€Ï„Î¹ÏƒÎ¼Î± Îµá¼°Ï‚ á¼„Ï†ÎµÏƒÎ¹Î½ á¼Î¼Î±ÏÏ„Î¹á¿¶Î½â€¢ Ï€ÏÎ¿ÏƒÎ´Î¿ÎºÎ¿á¿¦Î¼ÎµÎ½ á¼€Î½Î¬ÏƒÏ„Î±ÏƒÎ¹Î½ Î½ÎµÎºÏá¿¶Î½, ÎºÎ±á½¶ Î¶Ï‰á½´Î½ Ï„Î¿á¿¦ Î¼Î­Î»Î»Î¿Î½Ï„Î¿Ï‚ Î±á¼°á¿¶Î½Î¿Ï‚. á¼ˆÎ¼Î®Î½. Such joint cooperation between Churches is unprecedented since the unfortunate schism that has endured for centuries. However, with the current trend towards Catholic unity, the responsibility of mutual understanding is incumbent upon all members of both Eastern Orthodox and Western (Latin) Catholics. The most important factor that needs consideration is the wish of Christ in His priestly prayer, â€œThat they may be one!â€ The roots of unity are very apparent between us and our ritual expressions through the Sacraments. Both East and West celebrate the Eucharistic Sacrifice on one single freestanding altar. Both Churches recognize the validity of each othersâ€™ Holy Orders. Even in extreme cases Orthodox Priests are able to provide the Anointing of the Sick, Absolve Sins and provide Viaticum to Latin Catholics that are dying. We both recognize the Real Presence of Christ in the Eucharist. We embrace a common male clergy and share appreciation of the Blessed Mother and the Saints. With all of the points in common, the process of reunification should prove inevitable. Most importantly there is a genuine consideration that calls both branches together, joined by faith, theology and ancient rituals. Theological matters such as the filioque question are things that are not insurmountable obstacles to reunion, but rather opportunities to appreciate the Eastern Orthodoxâ€™s understanding of the same Triune God. If indeed anyone were to say that reunion between East and West is that simple does not really have a keen appreciation of the historical, social and political factors that contributed to the split in the first place. What is important however is the desire towards mutual resolution of these points of contention with a prayerful understanding of the developing Mystery of the Body of Christ. John-Paul II made reference to the Eastern Orthodox branches of the Church as essential to permit the continued breath of the Holy Spirit. With the unity of the Holy Spirit in mind, the time to once again to join East and West has come, and put historical disputes into the realm of ancient but common histories. Hugh J.McNichol is a Catholic author and journalist writing on Catholic topics and issues. He attended Saint Charles Borromeo Seminary in Philadelphia, where he studied both philosophy and theology. He writes frequently at http://verbumcarofactumest.blogspot.com & http://nothing-left-unsaid.blogspot.com . Hugh writes about his Irish Catholic upbringing and educational experiences at http://graysferrygrapevine.blogspot.com . He has contributed works to Catholic News Agency, Catholic Online, The Irish Catholic, Dublin, the British Broadcasting Company, London and the Philadelphia Bulletin, Catholic Exchange, Pewsitter.com, Blogger News Network & The Catholic Business Journal and Wilmington Examiner. Comments are always welcome at hjmn4@gmail.com. No user commented in " Healing the Schism of 1054! "